The digital world we live in is permanent and, with each post, kids are creating a digital footprint. A digital footprint (sometimes called digital tattoo) is the information that exists online about you and your activity. 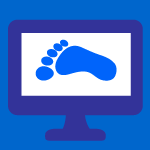 Being safe and responsible online will help ensure your digital footprint does not damage your reputation. Important information about how your online life can affect your physical life and reputation. How can information you post online affect your future opportunities (college/work)? What are the consequences of over sharing online?